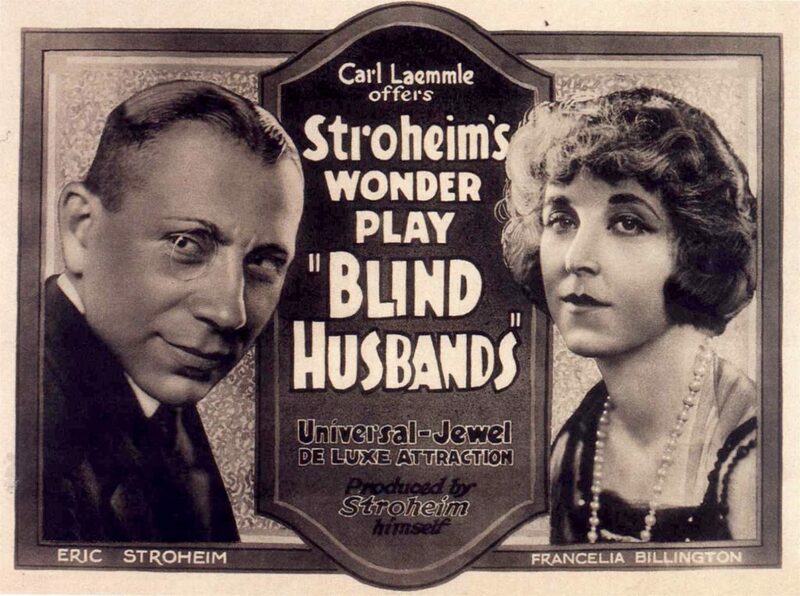 Blind Husbands is a 1919 American drama film directed by Erich von Stroheim. The film is an adaptation of the story The Pinnacle by Stroheim. A group of holiday-makers arrive at Cortina d’Ampezzo, an Alpine village in the Dolomites. Among them are an American Doctor who does not pay much attention to his wife and an Austrian Lieutenant, who decides to seduce her. He manages to befriend the couple so that, when the Doctor has to leave to help a local physician, he asks the Lieutenant to look after his wife. When the Lieutenant becomes too pressing, she promises to leave with him but asks him to give her more time. During the night, she puts a letter under the door of his bedroom. The Doctor goes on a climbing expedition with the Lieutenant, who had been bragging about his exploits as a mountaineer. In fact, he is not in very good shape and the Doctor must help him to reach the summit. In the process, the Doctor finds his wife’s letter in the pocket of the Lieutenant’s jacket, but before he can read it, the Lieutenant throws it away. He asks the Lieutenant whether his wife had promised to leave with him and the Lieutenant gives a positive answer. The Doctor decides to leave him on the summit and starts his descent, despite the Lieutenant now saying that he has been lying because he thought the Doctor would not believe the truth. On his way back, the Doctor finds his wife’s letter, in which she had written that she loved only her husband and asked the Lieutenant not to bother her any longer with his attentions. While pondering whether he should go back to get the Lieutenant, he loses his balance and falls down. When the Doctor is finally saved by soldiers, he asks them to go and help the Lieutenant. Before they can reach him, the Lieutenant, attacked by vultures, falls to his death from the precipice.